PSNews – The Ministry of Public Security on January 29 held a meeting with representatives of diplomatic missions of international security organizations and police agencies of countries in Vietnam as well as leaders of some domestic ministries, agencies ahead the upcoming Year of the Pig. The event was chaired by Senior Lieutenant General Nguyen Van Thanh, Deputy Minister of Public Security. Deputy Minister Nguyen Van Thanh speaking at the event. On behalf of the Public Security Central Party Committee and the leaders of the Ministry of Public Security, Deputy Minister Nguyen Van Thanh extended New Year greetings to the international and domestic guests. Deputy Minister Nguyen Van Thanh reaffirmed that the close relationship and cooperation between the Ministry of Public Security of Vietnam and all diplomatic missions of international security organizations and other countries, and domestic ministries, agencies are developing well in all aspects, and has reaped positive results. Deputy Minister Thanh noted that the Ministry of Public Security has signed many cooperation deals with international partners, including the Agreement on Cooperation in Ensuring Information Security between Vietnam and the Russian Federation; Memorandum of Understanding between the Government of the Socialist Republic of Vietnam and the Government of the United Kingdom of Great Britain and Northern Ireland on cooperation in human trafficking prevention and control; Agreement on cooperation in preventing and combating transnational crimes between Vietnam and Singapore, to name but a few. 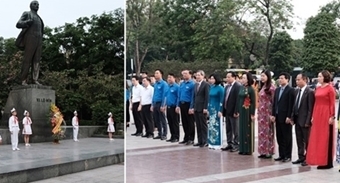 The Ministry of Public Security of Vietnam and its foreign partners promoted exchanges of high-ranking delegations and cooperation in education and training, technology transfer in security industry last year, contributing to deepening friendship and international cooperation between the Vietnamese Public Security Forces and law enforcement forces of other countries. Meanwhile, Vietnam participated actively in multilateral security mechanisms, particularly in regional and international security forums, to convey the foreign policy of the Party and State of Vietnam and also contribute to solving regional and international security issues. The bilateral and multilateral relations of the Vietnamese Public Security Forces also contributed to raising the position of Vietnam in the international arena. According to Deputy Minister Thanh, through international cooperation, the Vietnamese Ministry of Public Security has also learnt much valuable experience and enhanced its coordination with law enforcement forces of foreign countries in the fight against transnational crimes and crime involving foreigners. The Deputy Minister of Public Security held that, in the coming time, the world and region will still witness unpredictable changes and face both traditional and non-traditional security challenges, particularly natural disasters, epidemics, climate change, environmental pollution, cyber security risks and terrorism, which will directly impact on security and order of all countries, including Vietnam. Thus, Deputy Minister Thanh emphasized that the Vietnamese Ministry of Public Security will strive to further cooperation with international partners in both width and depth, and actively participate in multilateral security mechanisms and international police forums within the framework of the United Nations, INTERPOL, ASEANPOL while expanding cooperation with other countries in the fight against crime, and in dealing with traditional and non-traditional security issues.